Snoqualmie Falls is a 268-foot (82 m) waterfall in the northwest United States, located east of Seattle on the Snoqualmie River between Snoqualmie and Fall City, Washington. 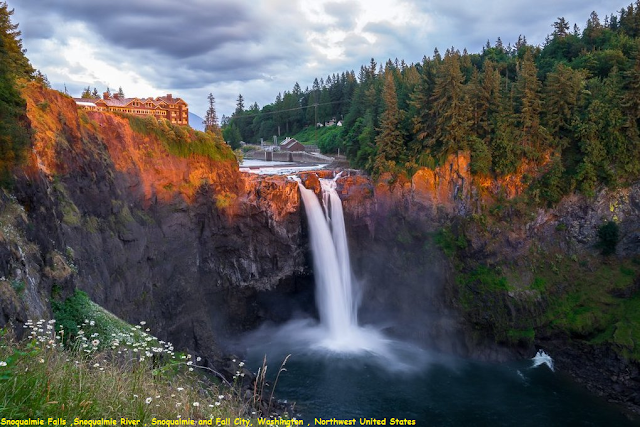 It is one of Washington's most popular scenic attractions, but is perhaps best known internationally for its appearance in the cult television series Twin Peaks. More than 1.5 million visitors come to the Falls every year, where there is a two-acre park, an observation deck, and a gift shop. Most of the river is diverted into the power plants, but at times the river is high enough to flow across the entire precipice, which creates an almost blinding spray. High water occurs following a period of heavy rains or snow followed by warm rainy weather. This can occur during the rainy season which lasts from November through March. During high water, the falls take on a curtain form.